Like the proverbial birds of a feather, they go together . Who could argue? This year Field Stone has a special treat for your Valentine! From now until the big day, only at Calgary Farmers Market, we are offering ALL of our luscious dessert wines at 15% off. Whether you choose one bottle or six, we’ll give you a great discount and package it up in cellophane and ribbon, ready to be exclaimed over on February 14th. Why are Field Stone dessert wines an excellent Valentine’s present? Because we have something for every taste. If you’re after a light and less-sweet dessert wine, perhaps to accompany milk chocolate, then our delectable Strawberry Dessert Wine is for you. Does your sweetie love rich ports? Saskatoon Berry and Wild Black Cherry await you. Pairing with dark chocolate? Our luscious Raspberry Dessert Wine has no equal. Or are you looking for a little sparkle? 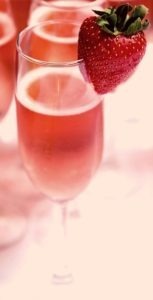 Add something bubbly to our Black Currant Dessert Wine and you’re ready for toasting the special day. And the best part of all? All five varieties are priced at less than $25.00 …. and, with any luck at all, your sweetie may even share it with you! Perhaps you are not in the market for a Valentine gift, but need birthday gifts this month. What could be better than a lovely Alberta wine, made from 100% Alberta-grown fruit? Or perhaps you are just looking for some long-weekend treats. Join the thousands who are supporting local and giving local this year. We appreciate all the support! And just a reminder that many of our dessert wines are available at retail stores around the province. If you can’t travel to us directly this weekend, check for a store in your area. Visit our Find Us Page for an up-to-date list of locations at any time. We have many fine merchants promoting our products in Alberta, for whom we are truly grateful! In addition to hosting Valentine’s Day, February is also a month of great events around the province. February 15th and 16th will find us at the Shaw Conference Centre in Edmonton for Winefest 2019. This year’s show promises to be bigger and better than ever. Winefest truly is a playground for the palate, where attendees have the chance to sample a delicious array of wines from all over the world, complemented by a selection of palate pleasing hors d’oeuvres. There will be both afternoon and evening sessions. Don’t miss it Edmonton – tickets are going fast! For ticket information, visit www.celebratewinefest.com. The following weekend, Winefest moves to the BMO Centre in Calgary. You’ll find us there on February 22nd and 23rd. Once again you’ll find remarkable wine vendors and excellent food at every turn, as well as fabulous door prizes and raffles. As an added bonus, you can visit the website for a chance to win an all-expense paid trip for two to Spain. You just may win the trip of a lifetime by taking a few minutes to enter! All information is at www.celebratewinefest.com. Hope to see you there! Also on February 23rd, we are excited to be a participant at Alberta Food and Beverage Expo – Medicine Hat. Held at Medicine Hat Exhibition and Stampede Park, this year’s show promises over 120 vendors, offering samples of hundreds of wines, beers, cocktails and the best food from Medicine Hat’s restaurants and local suppliers. If you’ve never attended this show, and you live in the Medicine Hat area, this is a great year to check it out. Tickets are available at Southwest Liquor, Moxie’s, and the Stampede office. More info at www.eatdrinkalberta.com and at the Alberta Food and Beverage Expo Facebook page. Finally, and last but not least, I’ll keep my recipe extremely simple this month. If you are lucky enough to get to share in a bottle of Strawberry Dessert Wine on Valentine’s Day, here’s a favourite way to enjoy it. You’ll be instantly transported back to summer, and you won’t be disappointed! Fill a glass or flute with the dessert wine and soda. Garnish with a fresh strawberry. And that’s all for this month. Happy February, Everyone! Enjoy some wine in winter real soon.